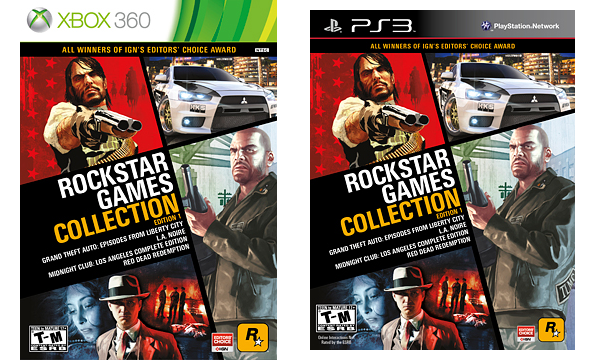 Rockstar have confirmed that the rumoured Rockstar Games Collection is indeed real, and will be going on sale in North America on 6th November, for PS3 and Xbox 360. The exclusive collection will retail for .99 and includes Red Dead Redemption, Grand Theft Auto: Episodes from Liberty City, L.A. Noire, and Midnight Club: Los Angeles Complete Edition. Comments by Rockstar on the newswire posting seem to confirm that the company has no plans to release this collection outside of North America, but they say to "stay tuned" regarding the possibility of other bundles. The '1' in the title of this release seems to imply there will be more to follow. There is no word on whether or not a PC version will ever be made. While many of you reading this will no doubt own one or more or perhaps all of these games already, there will be many people who still don't, so be sure to let them know of this great deal. That news bulletin came up after I went to their news wire and reported about Game Informer, pretty exciting, given that everyone's expecting and has been expecting some V news before the year's out! Even hoped the game might slip out before Christmas, but I firmly believe they can't plot a release date while working on the massive project, it's always something that's changing. Like films, they can mandate a release date from the studio, but the project itself is never fully finished / realized. As for this package, in the used gaming market, each title is now about USD, so you save USD off the complete package which could have sold for I'd wager. But being dated as they are, even now, it's best at reduced cost for all of them. Do you guys feel the DLC for RDR could match up to GTA IV's DLC Episodes in value, or is this package the better way to go? Awesome deal, I just got a 360 and I wanted to get some of the Games but was too afraid that I would over pay for 4 year old games.. But this is great.. your paying for 4 games in 1. No offense to those who like the above games, but HD releases of GTA III, Vice City, San Andreas, LCS, and VCS would be far more welcome news to me. GTA IV and Saints Row 2/3 aren't cutting it for me anymore.